I am finally back from my trip to Virginia (I plan on creating a blog with vacation photos soon). I have a few sketches to post but it is late so I'll strech it out over a couple of different posts. As for this post; I'm not sure if it was all the flying or what but this really rough sketch of Hawkman was the first thing I drew on the plane on my way out to VA. Hawkman used to be one my favorite slghtly obscure characters when I was younger. He was on one of the incarnations of the Superfriends... I think it was "Challenge of the Superfriends" and I had a comic with him and Hawkgirl solving some cool mystery on a rainy night. Anyway, for some reason I've recently found myself becoming fond of the character again for some reason. He has a great, classic costume. I think we might see some more Hawkman drawings sometime soon. By the way I'm a little rusty so bear with me. I'm sure some of these pieces will start to become a little cleaner as time goes by and I get back into the swing of things. 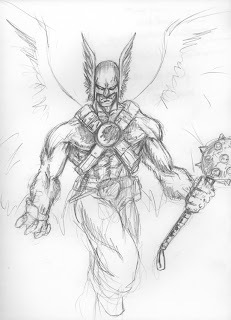 i thought hawkman was cool too... UNTIL IDENTITY CRISIS... good sketch tho, keep it up!